World mountain bike champion Kate Courtney essentially grew up on Specialized bikes, having raced as a sponsored rider since her early teenage years. It will be a big change to see her riding for the Scott-SRAM team in 2019 and 2020. We caught up with the 23-year-old Californian via telephone just before the start of the new year to learn about why she is making such a significant change with the Tokyo Olympics looming. She expects team director Thomas Frischknecht, an Olympic medalist in 1996, and teammate Nino Schurter, the reigning Olympic champion, to help guide her through the next two seasons. Courtney also explains how Frischknecht and Scott-SRAM were interested in her well before her breakthrough worlds win, which meant a lot to a rider in her first year out of the under-23 category. VeloNews: You’ve ridden with Specialized for essentially your entire life, how hard was this decision to make? Kate Courtney: It was definitely a really challenging decision for me. I’ve actually been racing on Specialized Factory Team for five years and for four years on the Whole Athlete Development Team before that. I definitely have strong roots with this brand, and it was a tough decision to step away, but I’m really excited about the opportunity that I have for next season. I really feel like it’s the right place for me in terms of a team fit moving into the next couple of years and with some really big goals on the horizon. VN: Are there some specific reasons why you are making this change? KC: Overall, my big focus is just on the opportunity that I have at Scott-SRAM. I’ll have the chance to work with Thomas Frischknecht as our team director and ride alongside Nino [Schurter], which obviously brings a lot of experience both in terms of just navigating life as a professional racer but also in terms of setting those huge goals and really executing their World Cup, world championship, Olympic plans. For me, that was a huge draw to the team. I think also their team atmosphere is something that really attracts me to their program particularly. I think they seem to have a really good balance between a love for the sport and being really serious competitors. And another reason is just the ability to have Thomas as a mentor and team director leading into these next big goals for me and trying to continue to make the jump to the elite field with Olympic qualification in mind. VN: Did you get to see this team atmosphere in person on the World Cup circuit? KC: Absolutely. It’s a small world and we all get along, which is great. 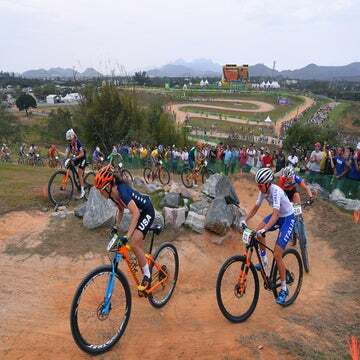 It’s been really cool to watch their team have so much success and have a really high degree of professionalism, but also show their love for the sport and excitement around mountain biking. Also, it was really inspiring for me to watch Jenny Rissveds, another young rider, rise through the ranks and take gold at the Olympics, and she did so with the help of Thomas Frischknecht. That’s certainly something that played into my decision and really gets me excited to have that mentorship and leadership in the next phase of my career. VN: Can you recall the specific day when you made the decision to move to Scott-SRAM? Was there something meaningful that helped make up your mind? KC: I don’t know if there was a specific day. It was a conversation that was happening for quite a while. It was something I considered throughout the second half of the season. One big part of it is that the team really showed interest and believed in me prior to my world championship win, which means a lot in terms of my development and their understanding of where I am as an athlete and my goals for the future. Obviously, that was a huge bonus and a really amazing performance for me, but I’m still a top-10 World Cup rider looking to make it to that top-five podium. I think they recognized both my potential and what types of things can help me develop and make that next jump. VN: Was there an offer on the table midway through the season? KC: Our conversations were in the middle of the season, but obviously there’s a lot that goes into those. A lot of conversations that have to take place, and also, of course, everyone wants to see how your season wraps up. VN: How will Scott-SRAM influence your 2019 race schedule? KC: I think one of the really special things about the Scott-SRAM team is that Thomas Frischknecht is the team director and they are a sponsored team, but they’re not a factory team. So the primary goal is high performance. They really sit down and let me have a lot of say in terms of what races I’ll be doing, what goals I’ll be targeting. And I have a lot of control over that. That’s something that definitely also drew me to the program. I think in the coming years, the focus on the athlete and performance and hitting those big objectives is going to be really helpful as I try to set bigger goals. VN: I assume the full World Cup calendar will be the skeleton of your 2019 schedule. KC: Absolutely. The World Cup starts a bit later, which is I think somewhat helpful for me. Last season was a really big season so having a little more time to build my base back up and start really fresh at those World Cups is going to be great. I will have the Pro XCT calendar as the start of my season, especially those California races are always big objectives and some of my favorite events. And I’ll possibly be adding some Swiss Cups as well, which is a fun opportunity, and we have great support over in Europe. VN: I take it you won’t be doing the Cape Epic this year? KC: I will not this year. It was a really fun experience and I’m definitely going to be back at some point, but I think for me right now, it was a huge volume block as such a young racer and my focus in the next few years is really sharpening up and trying to make it to the front of that World Cup field and to the front of that world championship field. I think it’s a good chance for me to focus more on cross-country racing and hopefully come back to it in the future. VN: Specialized made you a special sparkle bike for worlds. Did you get to keep it? KC: The USA bike is actually at the Mountain Bike Hall of Fame in Fairfax [California] right now, which is so special for me. I donated a world champ signed jersey to them, and it’s on display there. So if anyone wants to see it, it is in the Mountain Bike Hall of Fame, which is super-awesome, and hopefully it will stay there. VN: Well, you’ll just have to get Scott to make you another sparkle bike. KC: I have heard there are sparkles in my future. Hey, the bike I’m riding is called the Scott Spark, so there you go. In terms of omens, I think we are doing pretty well!